Ron and I recently traveled to Europe and we were lucky to meet with several creative thought leaders working in the field of dementia. Over the next weeks, we’ll share some of their insights with you, ideas we can incorporate into our every day lives as care partners, friends, and dementia advocates. 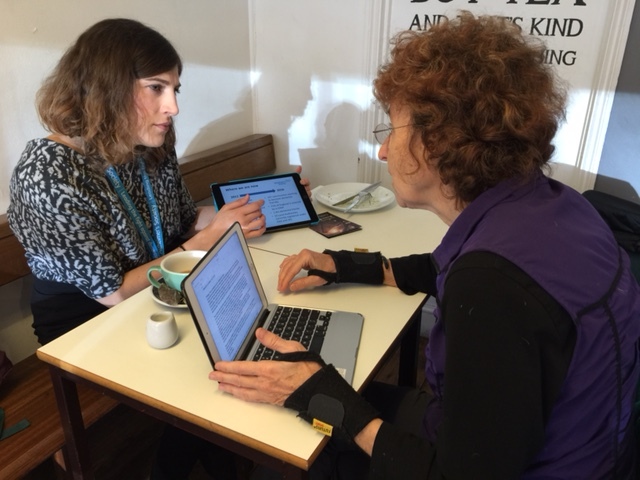 We met with Philippa Tree, Senior International Officer Alzheimer’s Society UK, in a charming coffee shop located near the Tower of London. The U.K. has more than one and a half million Dementia Friends, and 10,000 Dementia Friends Champions, volunteers who deliver the Information Sessions. Their goal–four million Dementia Friends in the next two years. Philippa Tree is part of the Dementia Friends team at Alzheimer’s Society UK. The Dementia Friends programme is a social action movement that aims to transform the way England and Wales think, act, and talk about dementia. It started in 2012 when the Prime Minister of the United Kingdom, in partnership with Alzheimer’s Society UK, urged his country to focus on building dementia-friendly communities. He became a Dementia Friend and challenged others to join him. The free Dementia Friends Information Sessions help people understand what living with dementia might be like. The sessions also offer small action steps so people can make a difference to those affected by dementia in their community. Anyone of any age can be a Friend by attending an information session or watching an online video. 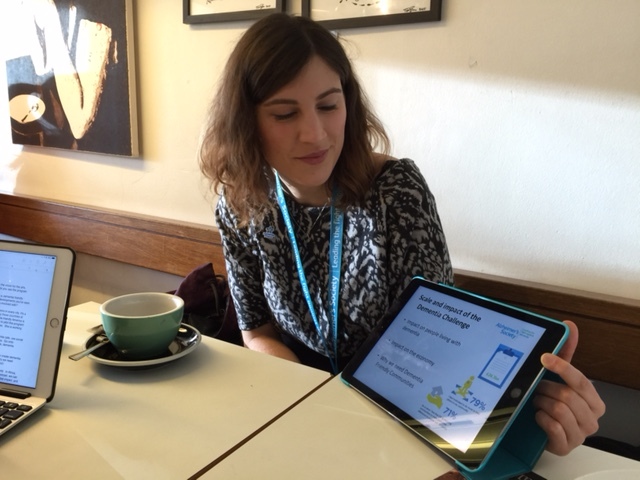 Philippa’s work with Dementia Friends extends beyond the UK and across the world. She’s recently been collaborating with partners in the United States to roll out a pilot Dementia Friends program in the near future. At the recent Alzheimer’s Disease International Conference in Budapest, Philippa facilitated a session with countries including Nigeria, Germany, Israel, Scotland, Canada, and Indonesia. Share positive stories about friends and family who are living with dementia. This helps reduce the social stigma. Volunteer for creative programs and events for those who are living with dementia. Spend time visiting family and friends who are living with dementia. Talk to other care partners and ask how their lives are enriched through their caring experiences. For more information about the Dementia Friends programme, please visit their website : www.dementiafriends.org.uk. This is a great idea. You have such incredible contacts!